How much thought have you given to paper? It’s a fragile medium, yet it can also be considered durable and strong. We learn to use it as children – for paper mache, posters and essays – but it continues to teach us lessons throughout life. 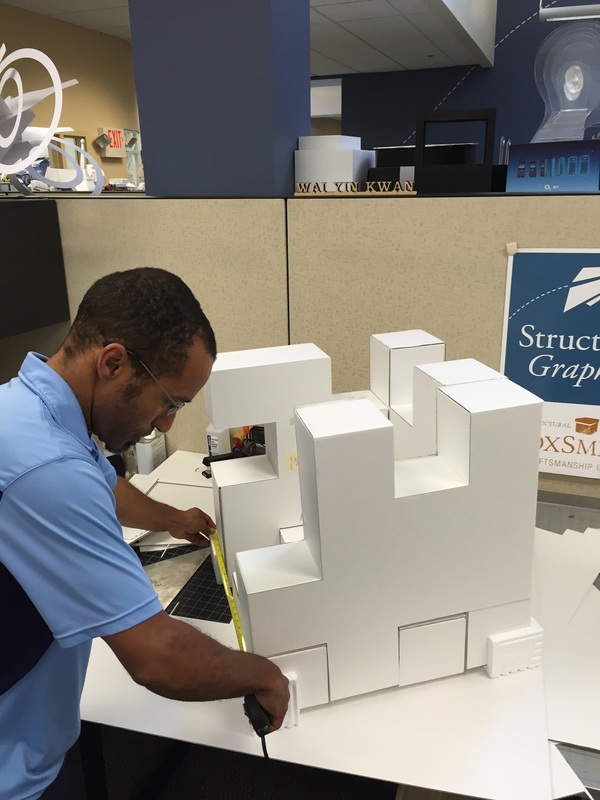 Here at Structural Graphics, it’s no surprise that we give A LOT of thought to paper: how it works, what it is and what it can be. And paper engineer, Isabel Uria, is certainly a testament to that. 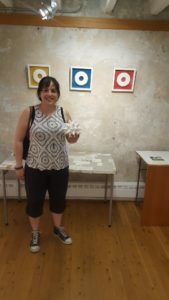 Isabel’s work is currently on display at the Drezner Gallery in Avon, CT until Sat., June 24. Paper Possibilities is a celebration of our understanding of paper as an expressive material. The artists in this exhibit come from a diverse set of backgrounds. 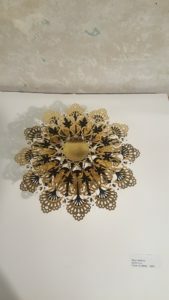 Some are paper engineers, some work with cut paper, some are origami artists, and some find their expressions in the creation of the paper itself. 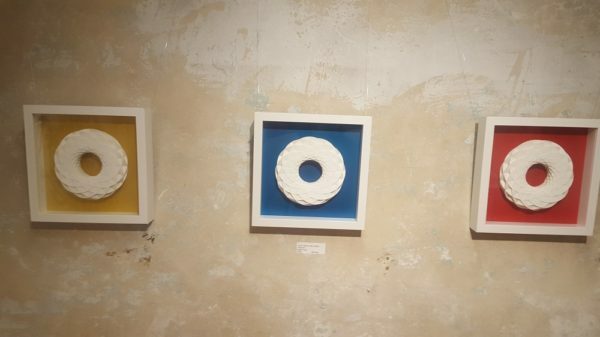 This is the first exhibition of the Paper Artist Gathering, a group based at the Hartford makerspace, MakeHartford. They have been working together and sharing techniques since November of 2015, and are ready to put forth their creations. 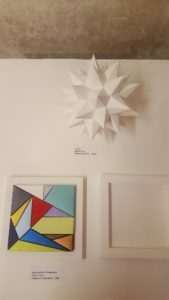 Their goal is to demonstrate that despite its reputation as a common material, the potential for expressions in paper is not yet fully explored. 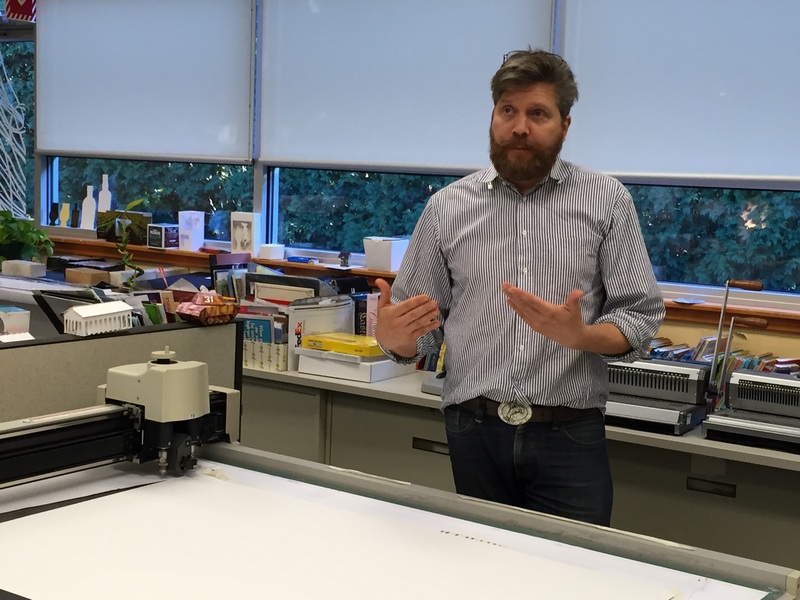 This is the second installment in our “What it Means to Say I’m a Creative” series, meant to focus on the inspiration and drive behind each one of our paper engineers. To read Part 1 of the series, click here. I think at an unconscious level I always knew I was going to work in the arts. I played piano for five years, and was involved in the school choir, theater, musicals and extracurricular art classes since middle school. Back then, I loved colors and painting, primarily.However, my journey with paper probably goes back to when I was 6 or 7 years old. My older brother had been given origami books for Christmas. I saw how he would make all these little creatures out of paper and neatly display them on his shelf. As any little sister, I idolized my brother. I wanted to be just like him! But he wouldn’t lend me his origami books!So one day, when he wasn’t looking or wasn’t around, I snuck into his room, took the books and started to try to follow the instructions on how to make all these little creatures through increasingly difficult pleats and folds. I succeeded on the beginner’s book but I failed miserably on all the more advanced ones. It took a while before I would understand and successfully accomplish complex paper folding like that. But if I have to look back at where I began with paper, I think that might have been my first experience with this amazing material. Work Hard. Work smart. Be true to your passions. Be persistent (without being stubborn). Be confident, but not cocky. Dream big, but also keep your feet grounded in reality (or at least keep a toe or two on the ground). Go forth doing your thing (whatever that may be) with constancy and fortitude! I guess much of this “advice” can really apply to any profession. At the end of the day, whatever you do, practice your craft passionately. Wouldn’t that make for a happier you? Being creative is inside all of us. Creativity is looking at a world of possibilities and acknowledging all the ways a problem can be brought to light and all the ways it could be solved. Creativity opens your mind. It is a path to visualize the past, the present and the future. Creativity is the opposite of war. It is the future. Evolution has happened because human beings have been curious to know and understand how things work and take that understanding to CREATE new developments and innovative things that serve our needs and help us. Creativity makes the world go around! It’s always fun to explain what I do. Unless you’re “in” the industry or closely linked to it, people don’t automatically know what a “paper engineer” is.First of all, we have not necessarily studied engineering in school, yet we work with paper as our material of choice in the same way an engineer does. We use the material —cut, fold, and paste it—to create an entirely new construct. The thing about paper engineers is that we can toggle that blurry line between being an artist and being a designer. We can be both! And sometimes, some of us are.Personally, I feel that’s awesome! I also feel very fortunate to be one of the people who makes a living in this profession. There are only so many people that do, and I think we all know each other! Or at least we know of each other. There’s a lot of responsibility that comes with being a designer because you’re the one that has to visualize the results, and make sure it works for the purpose that it is needed. As a creative I have to come up with a compelling, grand, aesthetically pleasing solution to the problem at hand. I have to design an eloquent way to express a message in 3D paper shapes and forms. I have to make things unique and innovative. Sometimes that comes easy, but sometimes it doesn’t. And criticism will always be there. Those are the struggles you deal with on a regular basis as a designer, as an artist and as a creative. To learn more about Isabel, please click here. Unboxing video views have grown 57% over the past year, and uploads have grown more than 50%. But it’s not just the growth in the unboxing genre that’s impressive—it’s the sheer volume, too. It would take more than seven years to watch all the videos on YouTube with “unboxing” in the title that have been uploaded so far just this year. And those videos have more than a billion views in this year alone. 4 million views, with 11 million projected by Christmas. On September 16th was the initial kickoff call to discuss concepts. At first, the sole and simple goal we had to accomplish was, “we need a box to hold products”. Originally, we started with a white box with clouds. All of these 7 technology products, which can be seen in the Google Store, could have easily been thrown into any old, standard, 8-sided-vanilla-box. But that’s not really our style. We then started with what any sensible person does in this day and age: we Googled it. 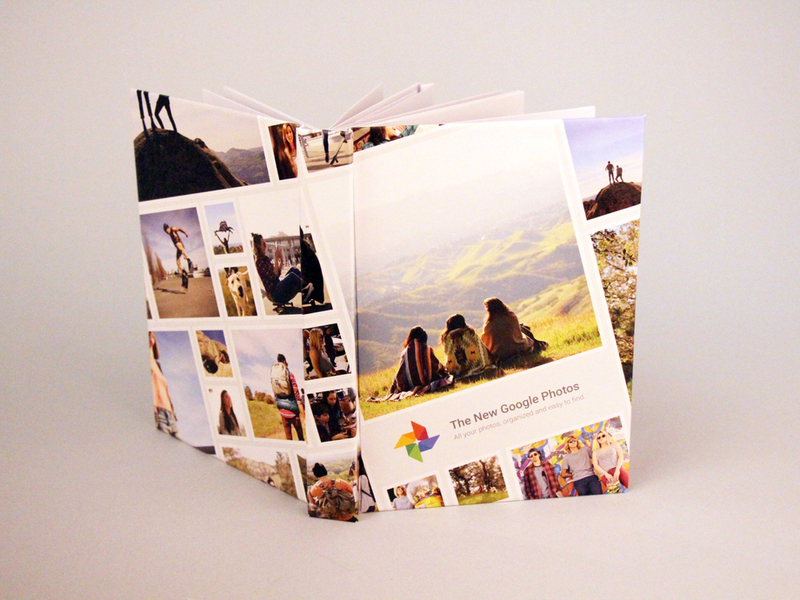 We googled the Google products to get grasp on what it would need to hold, specifically the size, and how we could package that up. 1. Google presented us with a ‘Mood Board’, basically a brain dump of what it needed to include, and 2. What not to do: not a traditional printing press or corrugate. I mean, let’s be honest here, creative freedom + super cool client = any designer’s dream. Our brainstorm session produced a list that looked like this: Rubik’s cubes, puzzle, with the idea to create more of an ‘experience’ than anything. Mission: possible. 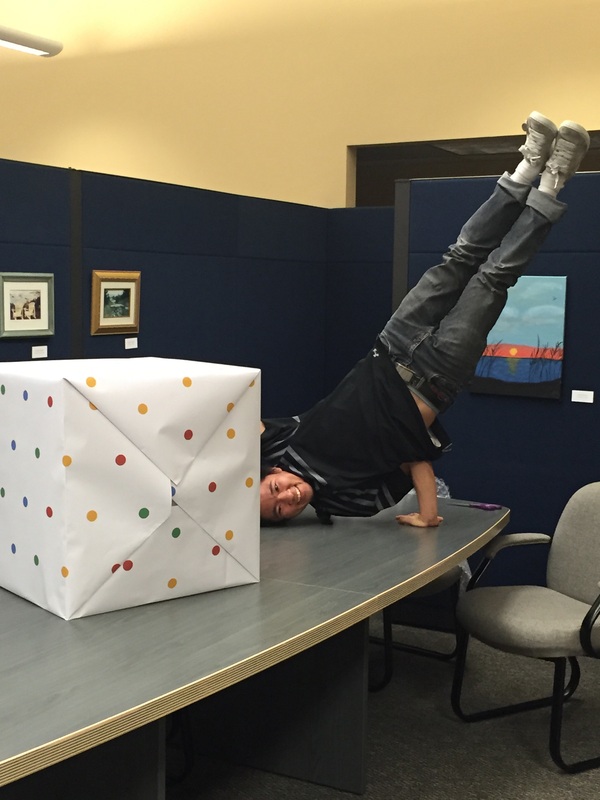 Erik, one of our paper engineers, came up with the puzzle box concept, and that’s when things with the entire team really took off. As you can see clearly, it was all hands on deck! From a design and materials standpoint, this box was pretty far out of the comfort zone for our group. The materials and scale of this project was foreign. 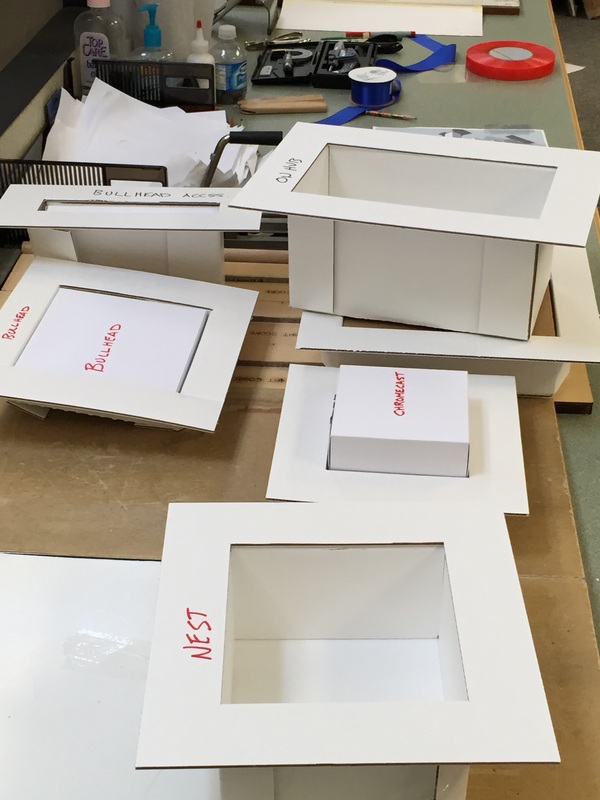 Typically, we deal with folding cartons, but every single person had hands on this project in order to turn around 2 sets of comps and “push the limits of design & engineering”. Of course, we echoed that. So, the design was complete, but the job wasn’t over. Once these people receive it, what was the user experience going to be like? There were a few small, yet critical details. First, was a card insert from the Google brand team, personalized & hand done with black Sharpie. Second, there was a little issue with the puzzle pieces, they didn’t quite stay together during shipment. Okay, thought our design team: how can we fix this? Why don’t we put it in gift-wrapping paper? 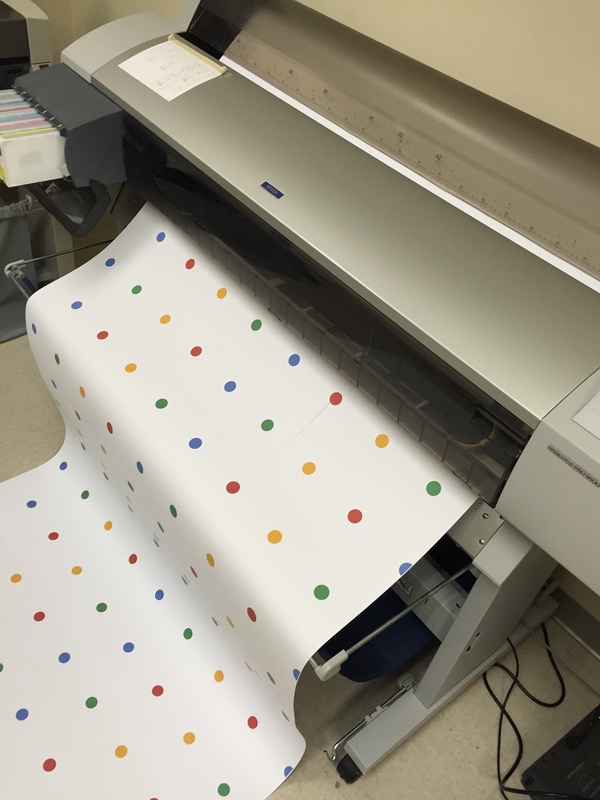 Develop custom Google wrapping paper, which was actually functional. Genius. Timing was a huge component for this project, considering it needed to drop by Black Friday. The second comp turn-around time was 3 days, and because of timing, we sent a template without sending a second comp. They never received a final produced prototype (only the press proof) before shipping to the influencers. The night before delivery was crunch time. Gustavo, Vice President, Operations, and Teresa, Director of Business Development, left Mexico at 1:45am for delivery. They had 2 hours and 15 minutes to make it. From there, it was Fed Ex same day shipped, with critical care, and a contract with independent TSA couriers. Anddddddd, *sigh* just in time. You might notice, if you’ve been paying attention to the timeline, that one of the most impressive parts of this story was the timing it took from concept to influencer delivery: 7 weeks. 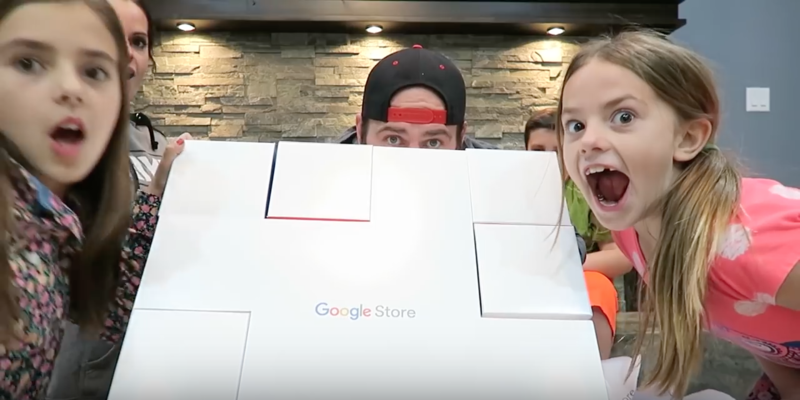 Watch the Unboxing for yourself below, or via these links: Shay, Sparklez, Andrea and Maya. See where it all started. In 2004, Structural Graphics broke ground at its Essex headquarters. And no one was more excited than this incredible foursome. 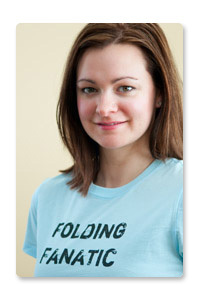 Now, the self-proclaimed folding fanatic is poised to break into new territory as a direct mail evangelist, creating inspiring educational resources for marketers who may be missing the boat on the power of mail. Witkowski recently spoke to Structural Graphics about her experience in the industry and what she plans to do next. SG: Has art always been a passion for you? TW: I would say I was always artistic. I was class artist, voted most artistic. Always drawn to anything creative. I started studying fine art [in college] and then I just realized there was never going to be any money in it, so I decided to go to a more marketable career and that’s when I switched over to graphic design. 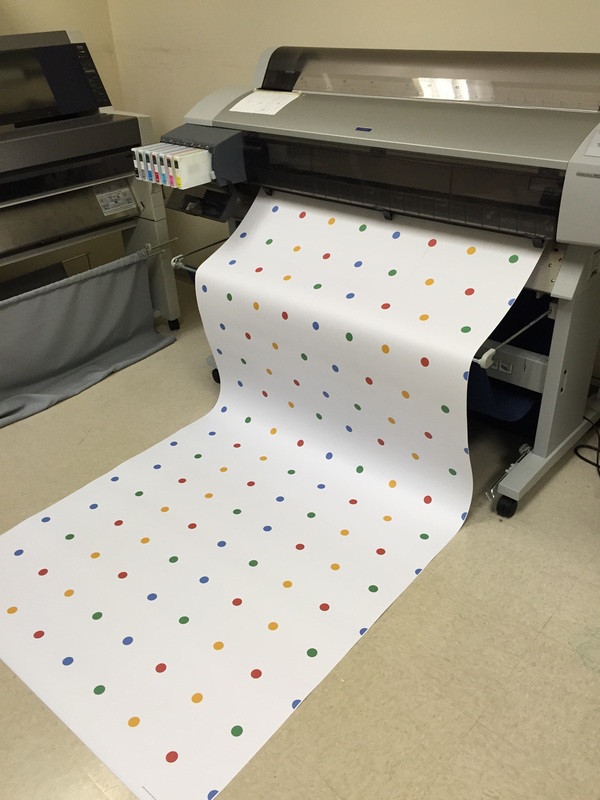 RIT has a world renowned school of print – one of the best programs in the world at the time – so I decided to get a masters degree there to improve my production skills and printing knowledge. That’s really where the interest in folding came around. I had to come up with a thesis topic and something that I was running into as a designer for RIT’s university publications department [was that] we kept using the same few folds over and over. So when I was coming up with my thesis idea, I decided I’d try to determine how many different ways you could fold a brochure. I thought it was going to be a quick project and it ended up being a seven-year research project that led to publishing FOLD: The Professional’s Guide to Folding. SG: How did the YouTube series start? TW: It came to me as an idea in the middle of the night. I was frustrated with not being able to get my message across and not getting people excited about the content. I had a speaking event years ago at one of the big print shows [and] was expecting 30 to 50 people to show up and three showed. I gave my presentation and left with my tail between my legs. That day I realized I had a choice. I could give up on this whole thing because nobody’s ever going to get it or I can reinvent myself. And that’s what I did. I had this idea and I decided to give it a funny name, “60 Second Super Cool Fold of the Week“, and have something fun and different every week and that’s how I came up with the slogan on my shirts. You can use the word ‘fold’ in just about anything and it makes sense. It’s been a fun hook to keep people watching. SG: Do you think today’s marketers are savvy about direct mail? TW: I would say there are certainly marketers today who are very savvy in mail, however I think there are a lot of people that need to learn more about it. Mail has an image problem. There’s this idea that technology trumps mail and mail is old school. What I hope to push out into the industry is really compelling evidence of how successful people are with mail. You combine highly targeted mail with a really great mailing list, an interesting format, a solid message and a compelling offer and it’s magical. I think people need to get re-acquainted with mail. 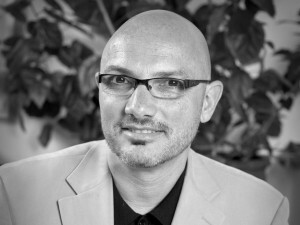 SG: What are the most important components to an effective direct mail piece? TW: The biggest most important thing is audience. It doesn’t matter how creative and beautiful the piece is if it doesn’t fall into the right hands. You have to get your audience right first. Then, once you’ve got the audience, you need to give them a compelling offer, a reason to act. Those are the two most important things. If it’s not to the right person or if the offer isn’t compelling enough none of the other stuff matters. SG: Do you think direct mail works better for some companies than others? TW: I don’t. I have a sample of a direct mail piece sent by an email marketing company. Even email marketers are sending mail. I think any business can benefit. I’m not just trying to be all-inclusive and broad. I really believe that because marketing is a relationship. I don’t see mail as the single point of contact. I see it as part of a cross channel marketing type of approach. 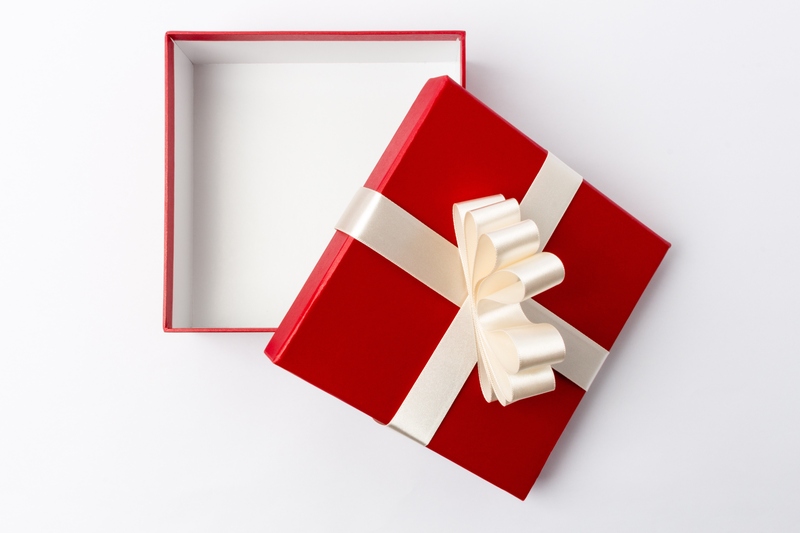 You might send an email sometimes to compliment your direct mail or do a web ad or other types of marketing too, but mail is a wonderful way to connect and create a relationship with your audience. It’s not as old school as people think. It really can carry different types of technology and drive people to other ways to be in touch with the customer. SG: Moving forward do you see your role changing? TW: It’s definitely going to continue down the educational path. It’s pretty neat I’ve been able to craft a career that’s interesting and fun to me. And to be able to share and inspire other people in the industry and ultimately promote print and the value of it. These days people want information and inspiration so I do a lot of speaking, video and writing – and I’m bridging into online learning. I’ve really gotten interested in direct mail. It’s an incredibly valuable marketing tool. It’s evolved for me from just about format to the whole process of creating effective marketing communications. Although I still am collecting things like crazy and all about formats and techniques. [Now] I’m talking about the process involved as well and getting results. Not just saying, ‘here’s a great idea for a cool format’ it’s more like ‘here are all the things you need to think about and here’s how format plays a role.’ Once people know how to use [direct mail] and what their options are I think they can really get tremendous payback from it. On Tuesday, June 19 from 6 p.m. to 9 p.m. Structural Graphics’ designer, Isabel Uria will share her dimensional artwork along with tips and advice for creating 3D designs at Invercote’s “Night of Timeless Beauty” in New York City. Join us. Reserve a space online. Video: a night with Invercote in New York City. 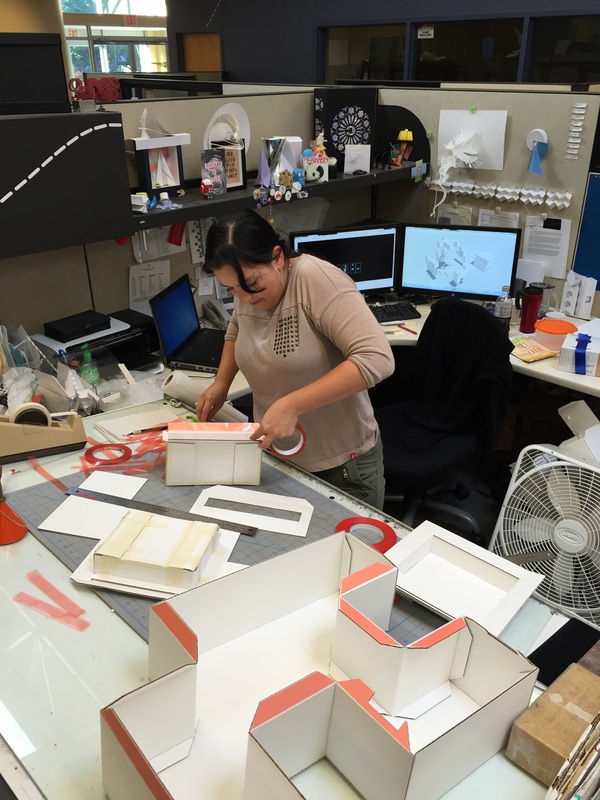 Isabel Uria, designer at Structural Graphics created complex 3D paper design for LOUIE awards gala last week. 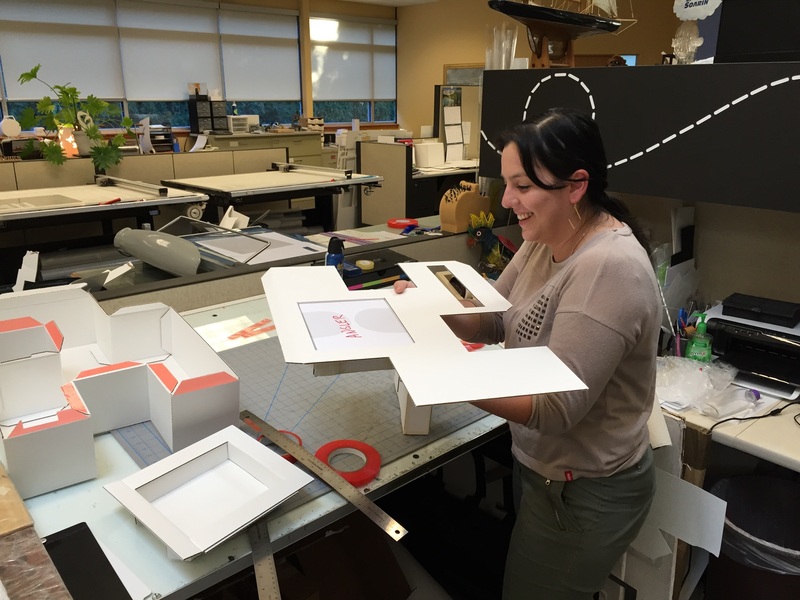 Isabel Uria, a designer and paper engineer at Structural Graphics, a 3D marketing design shop, created a complex 3D paper design for the LOUIE awards event, last week. Uria describes the LOUIE awards as “what the Oscars are for film; the LOUIE awards are for greeting cards. It’s the most prestigious award for my field and for people who make greeting cards for a living.” This year’s show had the theme: “The Artist & the Card”. The LOUIE awards – now in its 25th year – is an official international greeting card awards competition named for Louis Prang, who created America’s first Christmas card. 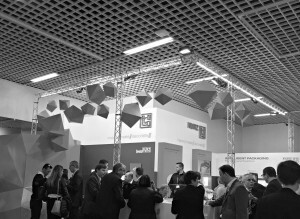 The event began in 1988 as a way to recognize top paper designs and designers. Ceremonies are held each year in New York. Her piece honored nominees and applicants while entertaining guests as they arrived at the gala. Its incredible size and scale, gave guests the sensation of walking through a tunnel and embedded throughout the design were approximately 200 paper airplanes, each one honoring the names of companies representing the artists who were nominated for an award, as well as those who won. “There were a lot of people that kept looking for their planes to take a picture. They were entertained by that. It definitely made it special for them.” says Urias. A graduate of the Maryland Institute College of Art (MICA), Uria worked as a freelance graphic designer and paper engineer in Baltimore, when she met design engineers from Structural Graphics at an event in New York in 2011. 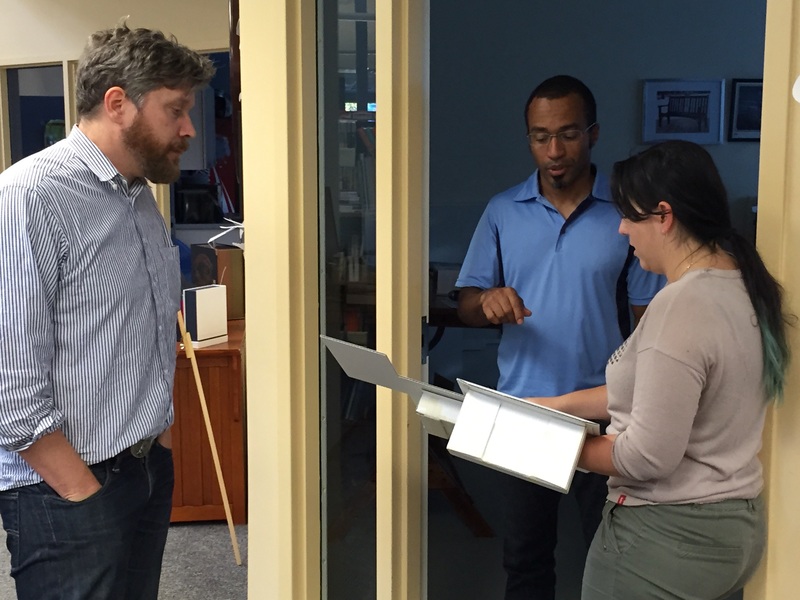 The meeting led to a job offer nine months later and she officially began at Structural Graphics in May of last year. “Each project is a thing of its own, [but] a project of this magnitude always spirals, and gives me ideas for other things I could do,” Uria says. We are pleased to announce that we are featured in this month’s issue of Deliver Magazine. 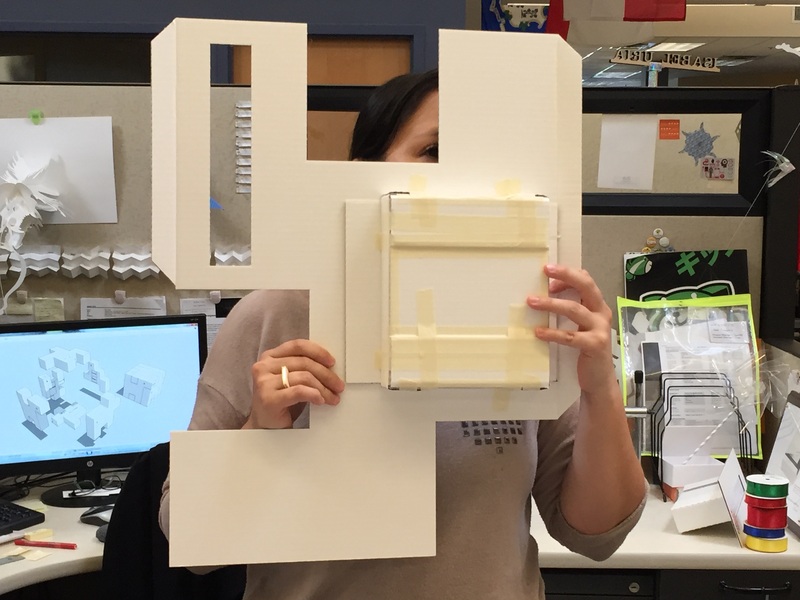 Ever wonder what our paper engineers look like? Ever wonder where all this paper magic takes place? In this article, you will see pictures of both and you can also read a little bit about why we do what we do. Click here for the article (we are on page 13).